On Alexander the Great’s deathbed, he was asked to whom he bequethed his Kingdom. Alexander’s reply was garbled, he may have said ‘Craterus’, his most senior general. However Craterus was not around at the time, Alexander’s other generals interpreted his reply as ‘Krat'eroi’ (“to the strongest”). Alexander’s generals, known as the Diadochi, squabbled amongst themselves over who was the rightful heir to the throne. 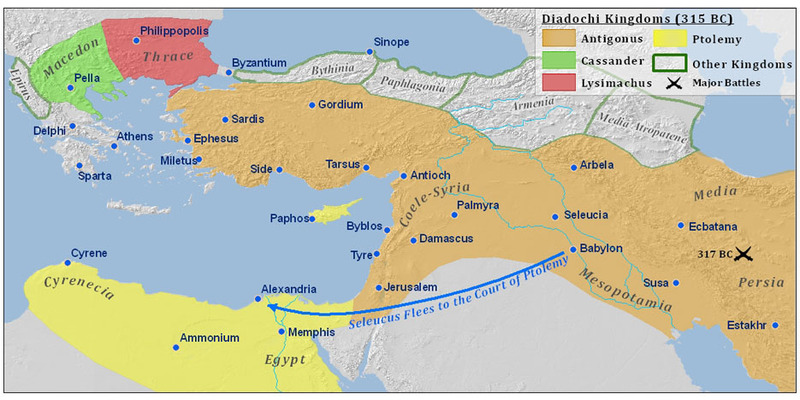 Originally at least 9 of the Diadochi vied for control of different parts of the Empire in a series of conflicts known as the Wars of the Diadochi. One of the most ambitious of the Diadochi was Antigonus Monophthalmos (“the one-eyed”, so-called because he had lost his eye in a siege). Antigonus was the first of the Diadochi to openly declare himself a king rather than simply a Satrap (Governor). Antigonus’s ambition was to reunite the Empire of Alexander the Great by defeating all the other Diadochi rulers, and by 315 BC he had come pretty close, uniting all of the Asian portion of the Empire under his rule. 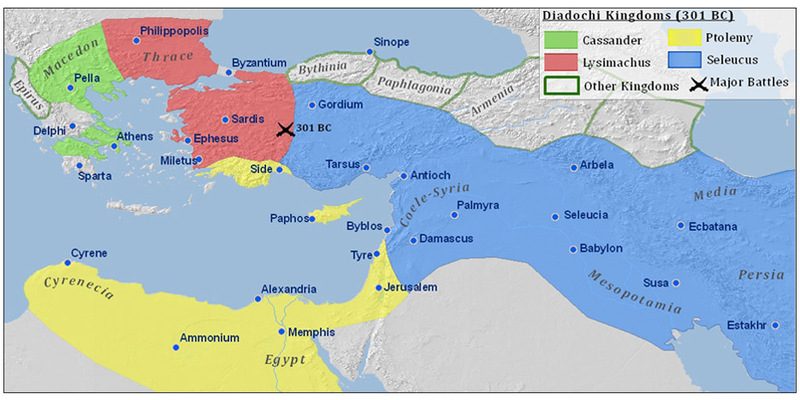 Such was the threat of Antigonus that the remaining Diadochi united together against him (See map 1 - 315 BC). In about 320 BC, Seleucus became the Governor of Babylon, however by 315 BC he was forced to flee the city when Antigonus Monophthalmos invaded. Seleucus fled to Egypt (See map 1 - 315 BC). 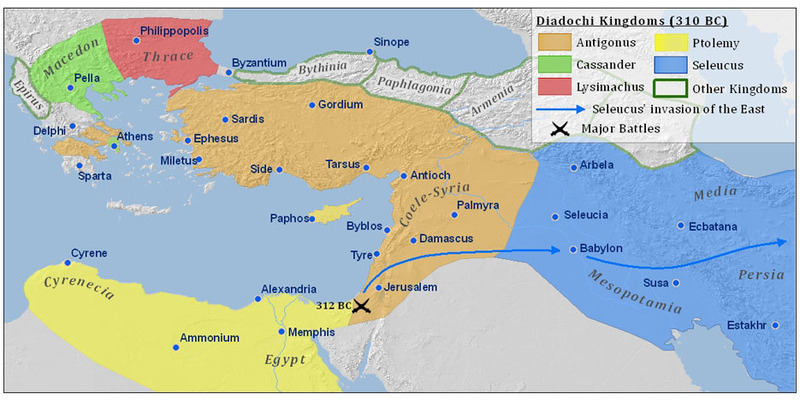 It was at this time, that the remaining Diadochi kings (Cassander in Macedonia, Lysimachus in Thrace, and Ptolemy I in Egypt) formed an alliance and waged war against Antigonus. Seleucus served as an admiral in the navy of Ptolemy I and proved himself to be very capable. Meanwhile on land, Ptolemy’s forces defeated those of Antigonus at the battle of Gaza, allowing Ptolemy to advance up the coast of the Levant. At this time, Ptolemy gave Seleucus a tiny force of 800 infantry and 200 cavalry so that he could return to Babylon. Seleucus was able to raise an additional 3,000 men from the towns and Greek colonies along the route and quickly retook Babylon. Nevertheless, his force was far too small to hold the city in the traditional way, when Antigonus’s allies (the satraps of Media and Aria) arrived to retake Babylon, Seleucus had hid his forces in the swamps around the city and launched a surprise attack during the night. Evangorus, the Satrap of Aria was killed and in the ensuing confusion, a great number of his men surrendered and agreed to fight for Seleucus. Seleucus now had about 20,000 men, but was still not powerful enough to face Antigonus in open battle. Instead Seleucus went east and seized control of the eastern provinces of the Empire. By 310 BC, an uneasy peace was established between the remaining Diadochi Kings: Cassander in Macedonia, Lysimachus in Thrace, Antigonus in the Near East, Anatolia and portions of Southern Greece, Seleucus in Mesopotamia and Persia, and Ptolemy in Egypt (See map 2 - 310 BC). The peace was not to last however, again the other Diadochi Kings allied together against Antigonus, he was finally defeated and killed at the Battle of Ipsus and his empire was split between the victors. However his son Demetrius Antigonid was able to escape the battle and a few years later he seized the throne of Macedon by murdering the son of Cassander (See map 3 - 301 BC). In 284 BC, Lysimachus, on the urging of his new wife, Arsinoe (daughter of Ptolemy), put his eldest son to death on the charge of conspiring to seize the throne. This atrocious deed aroused great indignation. Many of the cities of Asia revolted, and Lysimachus’s most trusted friends deserted him. It was the perfect pretense that Seleucus needed to invade the territory of Lysimachus. In 281 BC, Seleucus’ army defeated and killed Lysimachus at the Battle of Corupedium. After some days his body was found on the field, only his faithful dog was still by his side, protecting his body from the vultures. The victorious Seleucus was now master of the domains of Lysimachus and had already begun preparing to take on Macedon, still held by the descendents of Antigonus Monophthalmos. He also was protecting the eldest son of Ptolemy I of Egypt: Ptolemy Keraunos. Ptolemy Keraunos had been repudiated by his father who had instead chosen his teenage son from his newest wife as his successor. Thus Seleucus had a somewhat legitimate excuse to meddle in the affairs of his former friend Ptolemy's kingdom aswell if he had chosen. For a moment Seleucus looked unstoppable, the dream of re-uniting the Empire of Alexander seemed achievable. But it was not to be, whilst Seleucus and his dependent, Ptolemy Keraunos were traveling together through Thrace, Keraunos stabbed Seleucus in the back, killing him instantly. Why would Ptolemy Keraunos do such a thing? We can assume that he felt Seleucus was getting too powerful, he must have realized that Seleucus had no intention of putting him in power in Egypt and was simply using him for his own ends. It turned out that the Oracle all those years back warning Seleucus to not hurry back to Europe was indeed spot on, for it was the moment when Seleucus left Asia for Europe that he met his demise. Seleucus was succeeded in Asia by his son, Antiochus I. Meanwhile Ptolemy Keraunos was able to seize the throne of Macedon for a brief period before being killed during an invasion by Gauls. Afterwards the throne of Macedon passed back into the hands of the Antigonids. 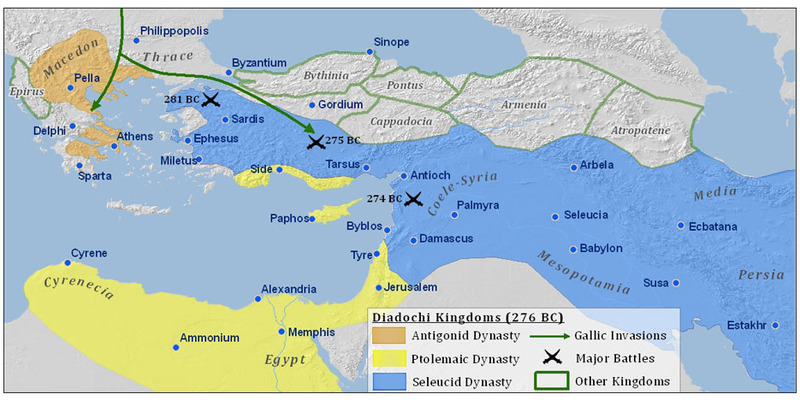 By 276 BC, there were just 3 Diadochi Dynasties left, their territories roughly divided between the three continents that the Empire straddled: the Antigonids in Europe; the Seleucids in Asia; and the Ptolemies in Egypt (see map 4 - 276 BC). These three kingdoms gradually stabilized themselves and would remain ruled by the same dynasties for another couple of centuries. That is not to say that conflict between them ceased, on the contrary, the wars between the three kingdoms continued, despite various marriages between the royal dynasties. Whilst none of the Diadochi, nor their successors were ever able to unite Alexander’s Empire, domestically Greek Culture flourished. 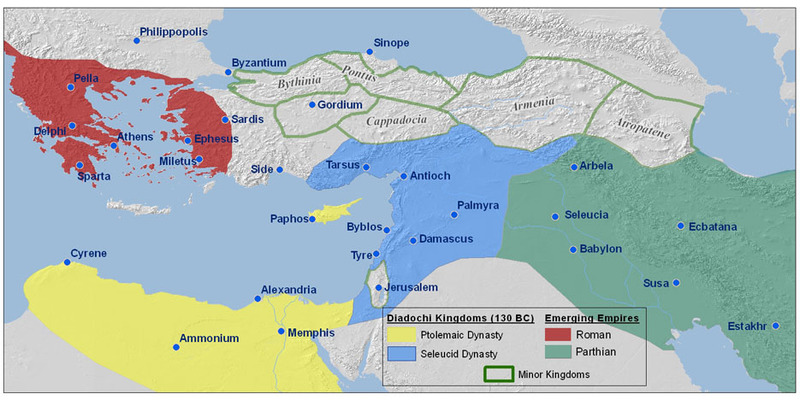 The Diadochi rulers prudently promoted the intermingling of Greeks with the local peoples in their Kingdoms, leading to a fusion of East with West. Many Greeks settled in the Near East and Egypt, and Greek became the Lingua Franca of the Eastern Mediterranean. The city of Alexandria in Egypt, with its Great Library, became the world center of learning. This period of Greek cultural expansion is known as the Hellenistic Age. In the Second Century BC, the newly emerging Empires of Rome in the West, and Parthia in the East began to encroach into the Hellenistic World (see map 5 - 130 BC), the Diadochi Kingdoms failed to unite against these threats, and one by one they fell. The Romans first conquered Macedonia and Greece, then they took what was left of the Seleucid Kingdom after the Parthians had already overrun most of it. Finally, the Romans conquered Egypt after Octavian’s war with Anthony and Cleopatra, the last Ptolemaic ruler of Egypt.